Building envelope experts generally speak of three or four different approaches to design of a wall for moisture control. Face seal walls are designed to achieve water tightness and air tightness at the face of the cladding. An example would be stucco applied directly to sheathing or masonry without a moisture barrier membrane such as building paper. Joints in the cladding and interfaces with other wall components are sealed to provide continuity. The exterior face of the cladding is the primary – and only – drainage path. There is no moisture control redundancy, i.e., there is no back-up system. 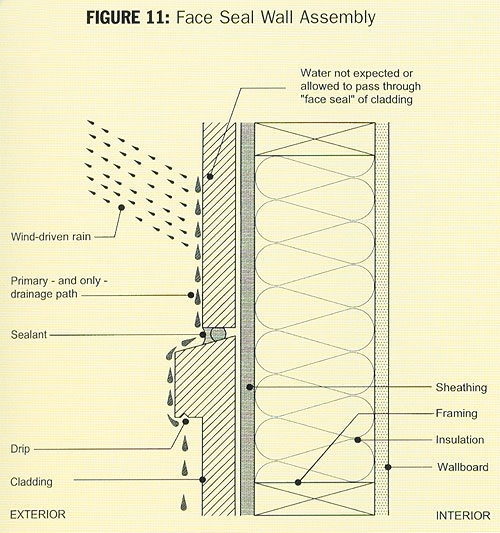 A face seal system must be constructed and maintained in perfect condition to effectively control rain water intrusion. In general, these walls are only recommended in low risk situations, such as wall areas under deep overhangs or in dry climates.Concealed barrier walls are designed with an acceptance that some water may pass beyond the surface of the cladding. These walls incorporate a drainage plane within the wall assembly, as a second line of defense against rain water. The face of the cladding remains the primary drainage path, but secondary drainage is accomplished within the wall. This drainage plane consists of a membrane such as building paper, which carries water down and out of the wall assembly. An example is siding or stucco applied over building paper. 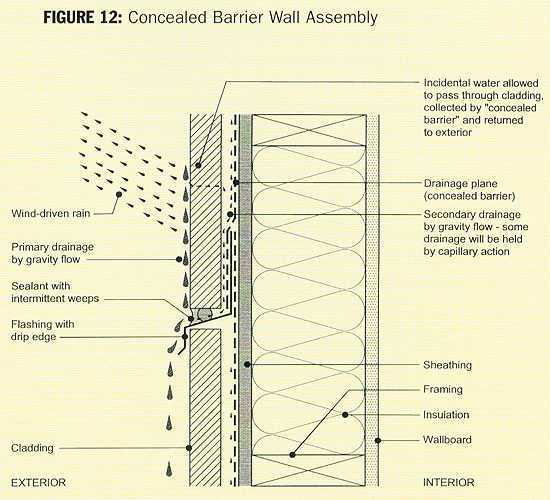 Concealed barrier walls are appropriate in areas of low to moderate exposure to rain and wind. Rainscreen walls take water management one step further by incorporating a cavity between the back of the cladding and the building paper. This airspace ventilates the back of the cladding, helping it to dry out. The cavity also acts as a capillary break between cladding and building paper, thereby keeping most water from making contact with the building paper. 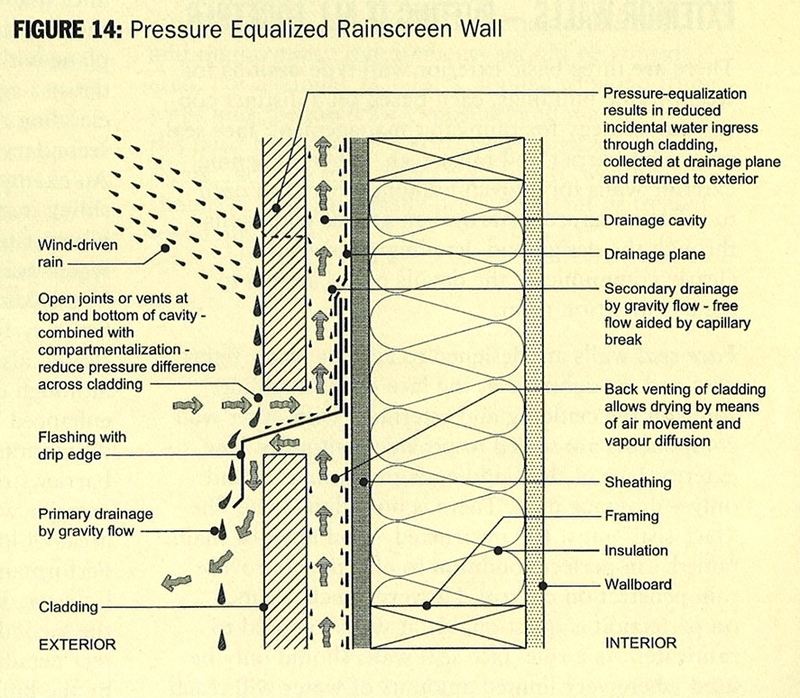 An example of a rainscreen wall is stucco or siding applied to vertical strapping over the building paper. 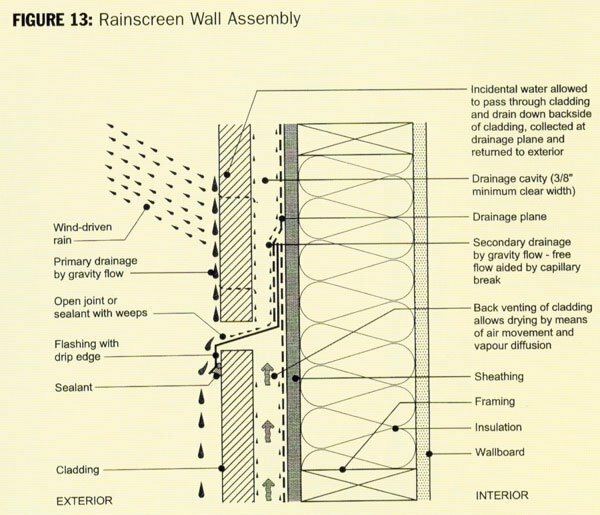 Rainscreen walls are appropriate in high rain and wind exposures. An advancement of the rainscreen technology is the pressure-equalized rainscreen. These walls use vents to equalize the pressure between the exterior and the cavity air, thereby removing one of the driving forces for water penetration (when it is pushed through cracks due to high pressure on the face of the wall and low pressure in the cavity). These walls are for very high risk exposures. In a rainy climate, an overhang is one of the simplest and most effective ways to reduce the risk of water intrusion. An overhang is an umbrella for the wall, and the deeper the better. A survey of leaky buildings in British Columbia commissioned by Canada Mortgage and Housing Corporation in 1996 showed a strong inverse correlation between depth of overhang and percent of walls with problems. However, even a small overhang can help protect the wall, largely due to its effect on driving rain. One important benefit of overhangs and peaked roofs often not appreciated is the effect of these elements on wind pressure. Wind-driven rain is typically the largest source of moisture for walls. An overhang and/or sloped roof will help direct the wind up and over the building, which reduces the pressure on the wall and thereby reduces the force of the driving rain striking the wall. This means water is less likely to be pushed by wind through cracks in the wall. Most rainwater problems are due to water leaking into the wall through holes. If care isn’t taken to protect discontinuities in the envelope, water can leak around window framing and dryer vents, at intersections like balconies and parapets, and at building paper joints, for example. Good design detailing and careful construction is critical! So is maintenance of short-life sealants like caulk around window frames. BC Housing-Homeowner Protection Office has updated the “Best Practice Guide for Wood-Frame Envelopes in the Coastal Climate of British Columbia” originally developed by Canada Mortgage and Housing Corporation and published “Building Enclosure Design Guide for Wood-Frame Multi-Unit Residential Buildings” with extensive information on design and construction detailing. For on-line design and construction tips, try the following:The Build a Better Home program, operated by APA-The Engineered Wood Association, runs training courses, operates a demonstration houses, and offers publications. The web site offers construction information and provides links to all relevant APA publications. Also see our Publications page. Building Enclosure Design Guide: Wood-Frame Multi-Unit Residential Buildings.